All of our fabrics are sourced from mills in the United States and Japan to ensure a premium wearer experience and lasting quality. We pride ourselves on their luxurious character and rich, soft-to-touch feel. Unlike many other brands, our garments are also ethically produced in the heart of New York City’s Garment District. We offer the assurance that every item is delivered in perfect condition from our hands to yours - each and every garment is hand finished, checked and pressed before they ship. 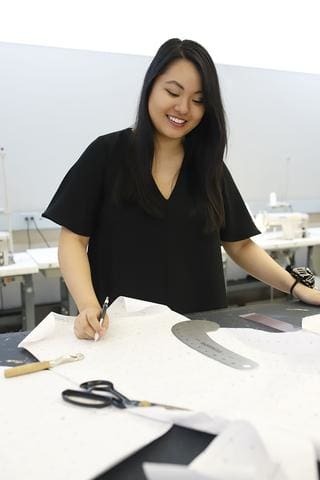 With her Australian upbringing, her education at Parsons School of Design in New York and her Eastern heritage, Lisa has embodied the best of Eastern and Western design. Her creations are a fusion of classic, Western silhouettes and innovative origami techniques with a focus on functionality, versatility and comfort. She is a firm believer that all women are powerful, sensual and unapologetically beautiful and that dressing for success is not limited to just blazers and pantsuits. It was from this ethos that LISA QU was born. The LISA QU lifestyle is about embracing the power that comes with being a woman. The modern woman is an achiever not a doer, she can be both a career woman and a mother, a jet-setter and a homemaker. She is anything and everything she wants to be. The LISA QU woman is an inspiration, not an aspiration. LISA QU provides timeless, affordable luxury manifesting in innovative origami details, form-flattering silhouettes and an emphasis on lasting quality.